Bicester Heritage Centre set on the site of the famous 1920s RAF Bomber Station just a few miles from the M40 at Bicester, Oxfordshire. With the experiences at Goodwood coming to an end, Bicester is the only place in the UK where you can take part in a Classic Car Experience at a nostalgic venue. Using the original buildings most of the site has been restored to a high standard by Bicester Heritage. As well as being used as the back drop to the film 'The Limitation Game', it is now home to the restoration, storage and enjoyment of vintage and classic cars, motorcycles and aeroplanes. Bicester Heritage is also a regular meeting place for many classic and vintage car clubs. 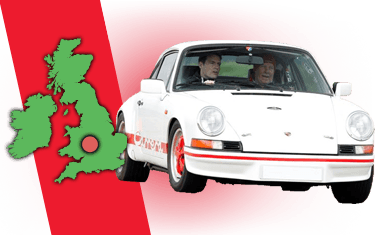 If taking part in one of the classic car driving experiences you will have the opportunity to explore the site, which is not usually accessible to the public. The track is marked out on the runway and taxiways and is roughly 1.3 miles long for the classic car driving. Other experiences may vary. Find available dates for bicester heritage centre driving experiences with our live calendar.